You want one. Admit it. Teeny tiny things are the cutest and this frog, the Paedophryne amauensis, is one of the tiniest creatures you'll ever see in your life. It was recently discovered just a few years ago in Papua New Guinea and it is only 7 mm long. My family and I saw an exhibit featuring the frog and promptly wanted three of our own. Of course we don't have the frogs... but don't you want one! 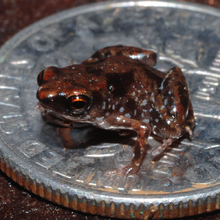 The frog happens to be the smallest vertebrate in the world as well. Not only are these frogs hard to see because of their size, but they also imitate bug sounds when they call, which makes it more difficult to identify them in the wild. They are so small that it's even hard to hear them! They have to be found by scooping up the litter on the forest floor and inspecting it. Have you seen any cool tiny frogs lately? Even if they aren't THIS small, share them in the comments!